I’m not sure where the time has gone but it left with no note on the night stand or a tepid wave. The summer time is officially gone and some of us never gave it the chance to leave with our pumpkin cookies, souffles and cakes. Even I was guilty of whipping up a batch of pumpkin, apple and cranberry biscuits for a food blogger gathering. I can’t help but to pause and think of all the fresh bounty that I never even tapped into. I think the wife and I will try tackling the company of a CSA box now and again. It would definitely assist in the rounding out of our diet which is simple in the least. At the end of the summer there’s always one last bunch of something that you come across and tell yourself you need. And thanks to the extended warmth this year we were blessed with more tomatoes than we knew what to do with at our fingertips. I had a bag of tomatoes sitting on the dryer that were on their last leg and so I decided to make jam. 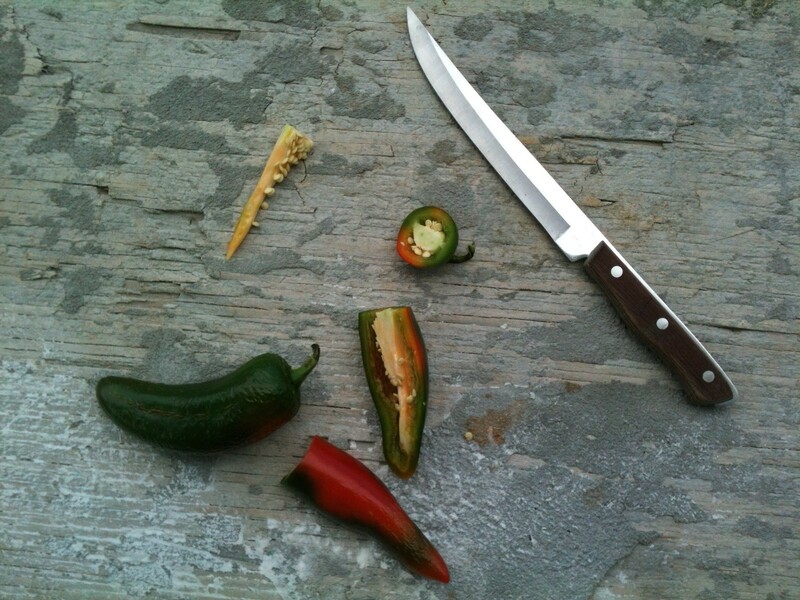 Most of our tomatoes met their demise with a clenched fist and a salt shaker but not these. They were destined to meet my favorite Cusinart pan with a little sugar, vinegar and salt. Not to mention a kiss of warmth from some jalapeno I had. I told myself many a time I was going to make Foodie with Family’s candied jalapenos which sound fantastic and I never got around to it, but it is still on my to-do list. It seems like yesterday the wife and I were making plans for the summer. No doubt, most of it would be consumed by work and the mundane details involved with being an adult. And now that I think about it, we never even made it to the pool once this summer. That’s an epic fail for us. But nonetheless, I was able to attend many farmers markets for the summers harvest and heirloom tomatoes were in plenty this year. There were so many recipes that I wanted to blog but I knew I’d never get the time with working two jobs and the balancing act of marriage and blogging. Of course, marriage always comes first and I like it that way. Regardless of what sh!t food blogger says, this jam won’t sit in the fridge and rot. I’ve already knocked one jar off on crusty baguette and have plans to use more on a seared salmon dish, coming to a post near you. 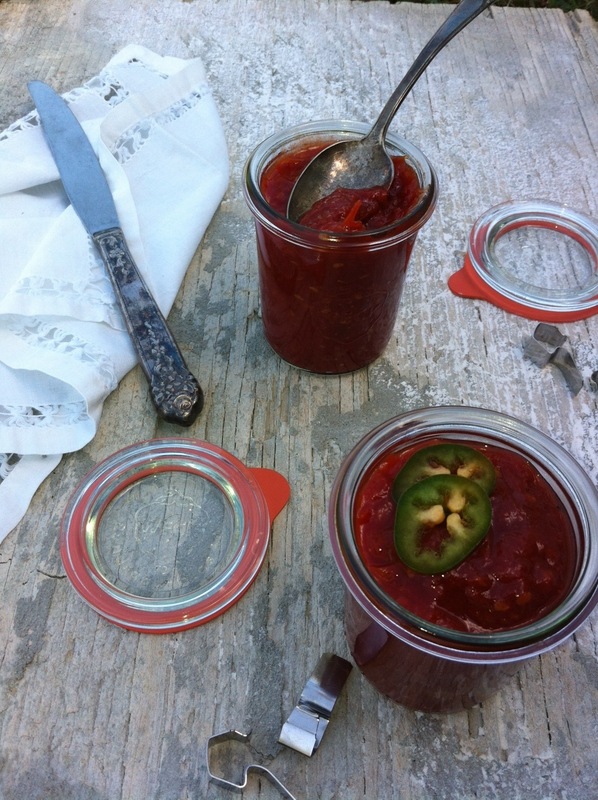 I grabbed a couple of jalapeno when I snatched these tomatoes from Bradley’s Farm stand and they sat on the counter for a couple of days before they were utilized in this jam. One of them began to turn a shade of red and while I was familiar with this I never questioned as to how this changed the flavor of the pepper itself. It turns out the heat actually becomes milder and you might say well the heat is in the veins. And Yes! This is true, but the fruit itself packs a little kick and what is there slowly dissipates with the deepening of the red and the color is quite the eye catcher. I can’t help but too pause and think of all the fresh bounty that I never even tapped into. I think the wife and I will try tackling the company of a CSA box now and again. It would definitely assist in the rounding out of our diet which is simple in the least. At the end of the summer there’s always one last bunch of something that you come across and tell yourself you need. And thanks to the extended warmth this year we were blessed with more tomatoes than we knew what to do with at our fingertips. I had a bag of tomatoes sitting on the dryer that were on their last leg and so I decided to make jam. Most of our tomatoes met their demise with a clenched fist and a salt shaker but not these. They were destined to meet my favorite Cusinart pan with a little sugar, vinegar and salt. Not to mention a kiss of warmth from some jalapeno I had. I told myself many a time I was going to make Foodie with Family’s candied jalapeno which sound fantastic and I never got around to it, but it is still on my to-do list. 1. 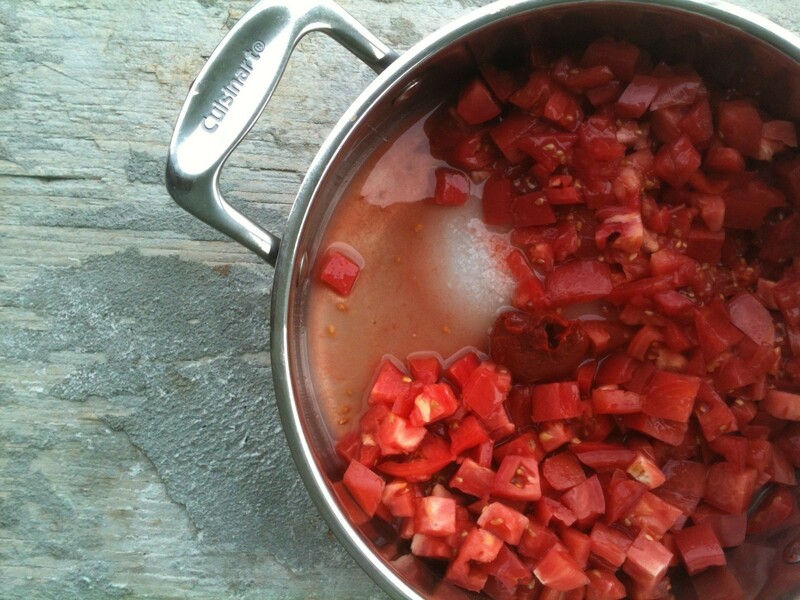 First, rinse, core and chop your tomatoes into 1/4″ x 1/4″ cubes. Does not have to be perfect shapes. You can even rough chop the tomatoes. set aside. 2. 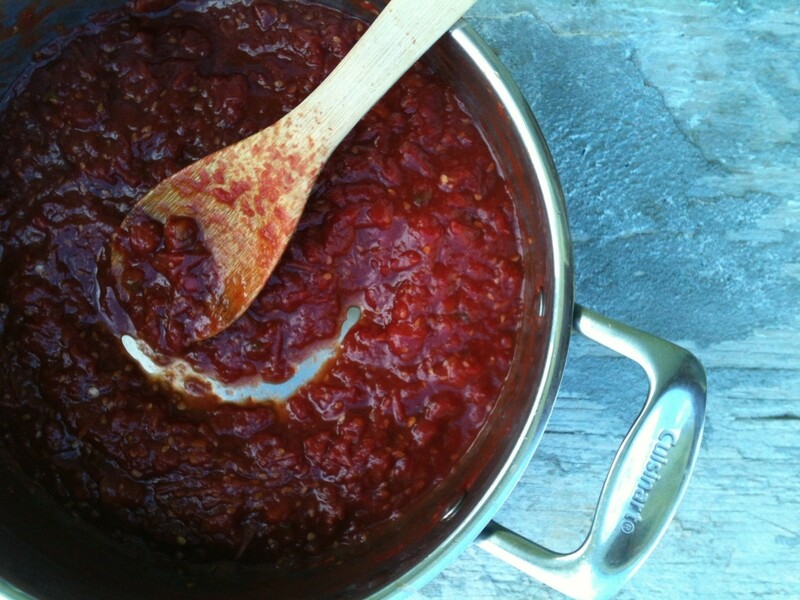 Add sugar, vinegar, salt and tomato paste to your medium sauce pot over medium heat. Stir until all ingredients become a syrupy paste. Add your tomatoes. Let the mixture cook for about an hour over medium heat. Make sure to come back and stir the mixture often. You really shouldn’t leave the mixture for long periods of time so grab a magazine or two. 3. 45 minutes into cooking your jam should have reduced by 2/3 and be thicker with a nice sheen. At this point, add your minced and seeded jalapeno to the mixture. Allow to cook for another 15 minutes or so to allow the flavors to meld together. 4. Turn off the heat and transfer jam into a bowl (preferably stainless steel or glass) that is a good conductor of heat/cold. You are going to make an ice bath and set the bowl with the jam into the bowl that contains your ice/water mixture. Stir until the mixture is cooled down and the mixture has become jam consistency. The mixture should cling to the spoon. Transfer to a storage container and enjoy on crackers, bread, fish or chicken. Get creative. When I thought about doing this post I remembered that jam doesn’t boil down to a whole lot. 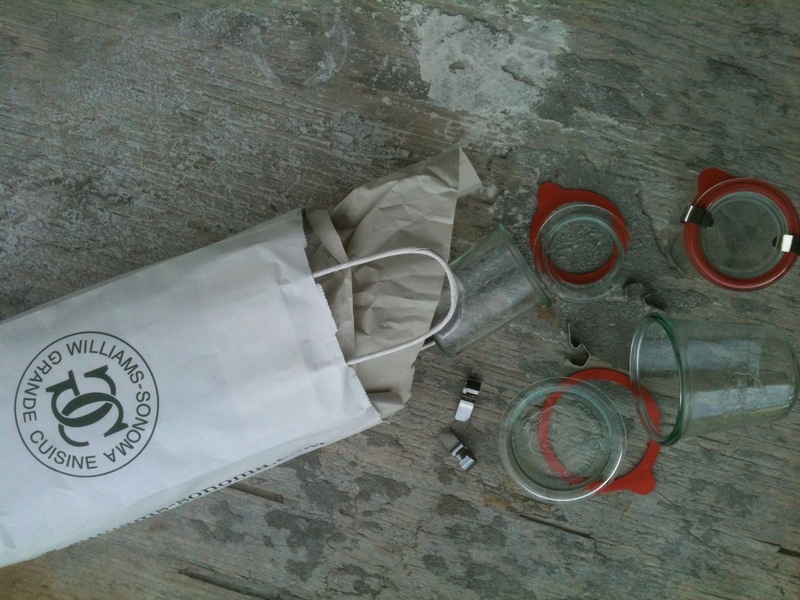 And since I don’t work far from a Williams Sonoma, you know I couldn’t resist these Weck Jars. Enjoy your jam and let me know what you’ve done with the end of your summer’s harvest? Though I know it isn’t over for everyone. Thanks for stopping by. Glad I could inspire you. This looks delicious! I’m definitely going to make it and try it on a toasted slice of baguette. I do have a question though – how much jam does this make? I’m thinking of canning this. I believe it was roughly around 140 ML. It only filled two small weck jars with a little left over. Enjoy, it’s one of my favorite summer recipes!